Most people are at least vaguely familiar with the Aztec calendar, mostly from the famous Aztec sun stone. But what was this calendar, and where did it come from? First, a little background. Mesoamerican cultures were developed in a region occupying land from Southern Mexico to Costa Rica. The people of this land began as a civilization during the time when Greece was becoming a power of the West. 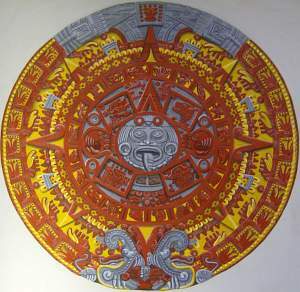 The Aztec sun stone, sometimes called the Aztec calender stone. A representation at the National Anthropological Museum in Mexico City. Through the period of Roman dominance and the crusades, these people shared a commonality in religion, myth, and in the calendar they developed from a study of celestial movements and their supposed effects on life on Earth. The Aztecs were the last of the great cultures of Mesoamerica before the European conquests. They continued the traditions of the first of the Mesoamericans who looked into the heavens for ways to live in the good graces of their gods and the universe around them. The Aztec people were an agricultural people that equated religion to survival. Aztec priests and leaders researched movements of the sun and planets in the sky. They followed a set of calendars to track planetary and solar events to make the most important decisions they had each year. The practices that accompanied solar, lunar, and planetary events were planned religious services in honour of their gods of the earth and sky. While gruesome ceremonies may have been an intrinsic part of the Aztec religion, it was the celestial calendars that directed these people to continue in the paths of their ancestors. The Aztecs actually used three calendars that were probably developed by the one of the earliest of the Mesoamerican people, the Olmecs. They were used to equate the current patterns of the sky and daily Aztec life just like they were probably used to direct the events of the early Olmecs. The Tonalpohualli was the most important Aztec calendar. This 260-day calendar marked the dates when the Aztec ceremonies were to be held. The Tonalpohualli consisted of 20-day periods each bearing the name of a different god. Starting from the first day, the number one through thirteen was associated with each god day. With 20 gods and 13 numbers, if run continually until a repeated god day and number would equal 260 days. This would run in repetition every 260 days. The next calendar the Aztecs followed was the vague year calendar that consisted of a 365-day calendar broken up into 18 20-day months with five days left over. The day god and number of the first day of the vague year named vague years. So if the beginning of the vague year fell on day god 2 Reed, then that would be the name of the vague year. Carving from the Aztec period of dedicated to the fifth sun, the era that the Aztecs believed they lived in according to the Aztec calender. The calendar is best represented by two calendar wheels, one that lists each day god in the 260-day cycle and the other wheel shows each of the 365 vague year days. Spun around together, it takes 52 years for a repeating of a vague year and day god together. This 52-year cycle was important to the Aztecs as they revered as a time of change that could make the current events more or less difficult depending on the signifying god days and their correlation to other celestial events. The final calendar was the Aztec long calendar that tracked each 52-year bundle of calendar cycles. The Aztecs used the long count calendar to track the patterns of civilization and celestial movements to determine the future outlook of an upcoming generational cycle. The Aztec calendars that had been in use since the beginning of the cultural revolution of these Southern American peoples derived an importance of life from the study and knowledge of time and space. The Aztec calendars made these people who they were culturally and the integration of religion, myth, and time proved to enhance some of the ritualistic endeavours. The peoples of the Aztec empire combined calendar events with ceremonies to show the people that their life was better because of the knowledge that the priests garnished from the heavens. The tracking of time and space allowed Aztec leaders to show through the history of time similar activity among the people. Using the past to foresee the future kept these kings and priests of kings in power because many things could only be explained through divinity, and divinity is how powerful kings keep the people in order within the civilization and the universe to the benefit of all.